Placing a gold Buddha panel wall hanging in your home bestows a feeling of peace and tranquility as it provides a sense of harmony and balance to the environment. Its symbolism comes from both the element of metal and the significance of Buddha in feng shui. 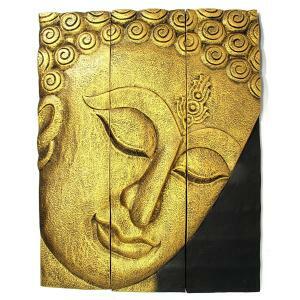 Wooden Buddha wall panels project the essence of serenity. These beautiful hand carved low bas-relief panels of Buddha, known as the Enlightened One, portray him with his peaceful gaze or his eyes lowered in contemplative thought. These exquisite works of art range in size from approximately 12" x 10" to more than 50" x 40". For example, you may decide to purchase a one panel luminous gold Buddha and choose from sizes ranging from 12" x 24" up to 30" x 60". You may want to go with a vertical stacked three panel set in sizes 12" x 27 up to a large display of 36" x 75". Greet all who enter your front door with this type of Buddha display and attract auspicious chi energy. Other gold Buddha panels are available in one or three-panel sets as gold leaf canvas wall panels. If you opt for a multiple panel set, you can either hang the three panels close together or space them farther apart for a modern look. You may want to place this type of panel(s) in the north sector of your home or the north wall of your home office. You can find larger gold Buddha panel art with panels that aren't identical in size, such as a five-panel canvas multi-picture stunning wall display. You can place this type of display in a meditation room or above a Buddha altar for a dramatic effect. Craftspeople make Buddha wall panels in several styles, each with their own meaning. The pose known as the Reclining Buddha is also known as the Dying Buddha or the Lying Buddha. The pose depicts a serene Buddha peacefully waiting to die. Having the knowledge that death is the transition from his physical life form to Nirvana, the Buddha knows that physical death releases him to a transcendental state and freedom from the cycle of rebirth. Buddha's expression is serene with closed eyes as he reclines with head propped up on his right arm. The flame coming out of the top of his head symbolizes his spiritual energy and shows he is in concert with the reality of his impending transition. Buddha's third eye is a large round eye (urna) that's located just above and between his eyebrows. This is another version of the Reclining Buddha. The urna symbolizes the radiation of Buddha's wisdom and his power to illuminate the entire world with a beam of light emitted from the third eye. A front view of Buddha's face reveals peaceful eyes and smiling lips. This Buddha pose makes a magnificent focal point for an east wall in a living room. Bhumisparsha Mudra: Buddha is seated with his right hand draped over his knee pointing to the earth. His right hand rests in his lap, palm up. Buddha touches the earth calling it to witness his words as truth the moment he attained Nirvana (enlightenment). Abhaya Mudra: Buddha holds out his right hand in front of his body palm facing outward in the gesture of fearlessness and protection. Place this panel in the southeast to protect your wealth or the east sector to protect health and longevity. Karana Mudra: Buddha sits with his thumb and third finger touching while the other three fingers remain erect pointing up. This is the gesture of quietening the mind and alleviating negative energies. Place this type of panel in an afflicted sector. Many practitioners of feng shui appreciate the feeling of peace and serenity that a Buddha statue adds to their home. Although there are many beautiful Buddha statues for the home and garden, hanging a Buddha wall panel is a choice often overlooked. In the practice of feng shui, Buddha locations involving placement of the Laughing Buddha, also known as Maitreya or the Buddha of Wealth, are the most common. People often place this auspicious statue of a happy Buddha on tabletops in living rooms to symbolize happiness and wealth. Adding the image of a serene Buddha enhances the balance and harmony in your home and life as positive chi flows freely throughout the environment. 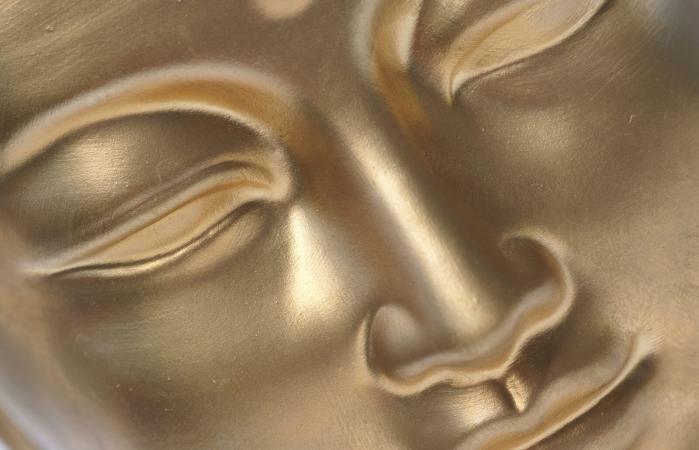 Gold Buddha wall panels are an ideal choice for a meditation area since they bring a calming influence to the decor. The presence of a Buddha symbol in your home for feng shui applications attracts auspicious chi energy. The magnificence of a gold Buddha panel will instill the same peace, harmony, and serenity the Buddha found and taught.